Cryotex Knives are at the cutting-edge of blade technology. Cryotex Knives are at the cutting-edge of blade technology. Each knife is forged using a unique cryogenic process, which exposes the blade to extreme high and low temperatures to create a cutting edge that&apos;s tougher, stronger and sharper than any other. Boasting elegant, sleek, slender designs, Cryotex Knives have a ceramic non-stick coating which allows for smooth cutting and easy cleaning. They&apos;re constructed with ergonomic easy-grip handles and gently weighted blades to create the ideal balance for clean cutting perfection. Protective scabbard covers store your knives safely when not in use and protect them from avoidable wear so you can enjoy years of precise, professional results. 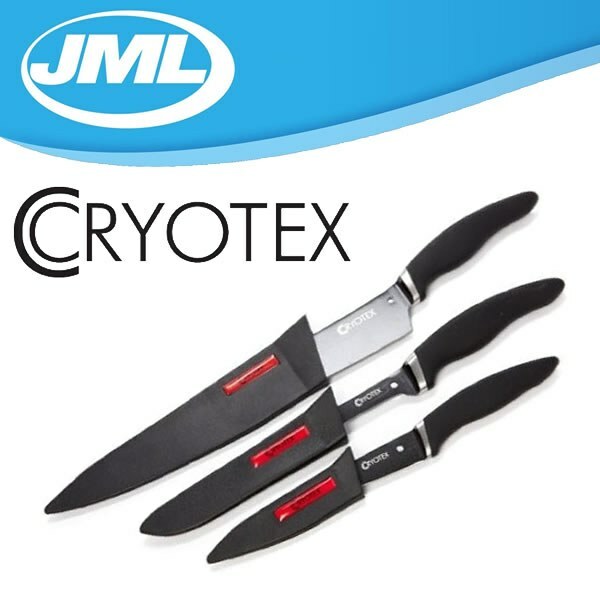 This Cryotex set includes a chef&apos;s knife, fillet knife and paring knife. For professional cutting precision, you won&apos;t find a set of knives as hard, durable, stylish and sharp as Cryotex. Great set of knives. Found out limit to large chef knife ( 30 lbs of onions before started get dull. Few strokes on the Sharpening rod. I was back in business. Highly recommend these knves. excellent, am purchasing another set.